Broods in Montreal or Quebec City? Inform me about the next events for Broods. Enroll yourself to our priority waiting list for Broods to be alerted when new tickets are available. Filling this form doesn't engage you to any purchase. 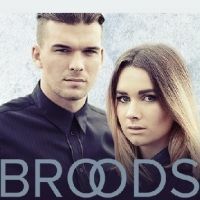 Broods are a duo of a brother and a sister. They released the single "Bridges", they were no 1 on the billboard in New Zealand. They signed with Capitol Records and Polydor . They will be in concert at Theatre Corona Virgin Mobil in may 2015. Call us for excellent tickets at 514-Tickets.